Follow us throughout the fall for posts which highlight library resources and information that support the Tiny: Streetwise Revisited exhibit at the Central Library and its community programming. The undiffused difference between the placid suburb of her youth and the rough-edged city that surrounded it became quickly apparent. In she went with her lens widening as a jagged journey ensued. Lengths and dimensions of lives spread across cityscapes of lost dreams, nightmarish realities, and undying hope. 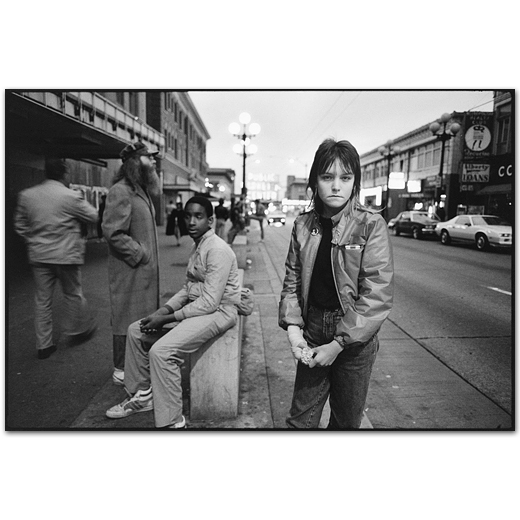 Mary Ellen Mark made her mark when the book Streetwise was first published in 1988. Within the reeking insides of a city, runaway children observed yet another stranger inserting herself into the frame of their lives. Who else could she be except a question dangling itself before their eyes until it, too, disappeared after having received an answering look. I miss Mad Men. Not any particular character or plot line: I miss the feel of it. That blend of humor and heartbreak, tinged with an uneasy dread that one might easily assume to be bygone innocence viewed through the lens of contemporary disillusionment and cynicism. Yet far more that the show’s meticulous period details and cultural conventions, the most authentically vintage aspect of Mad Men was that very sense of mid-century malaise, reflected by the books and movies of the time.